It all started when we received a call from Deepali. What she let us know was capable of letting a chill run down our spines. We knew she had hopes from us. And we had never done something like this before. But we could surely do it for a friend. On the phone, Deepali narrated how her mother, while working in the kitchen, suffered with 55-60% burns. 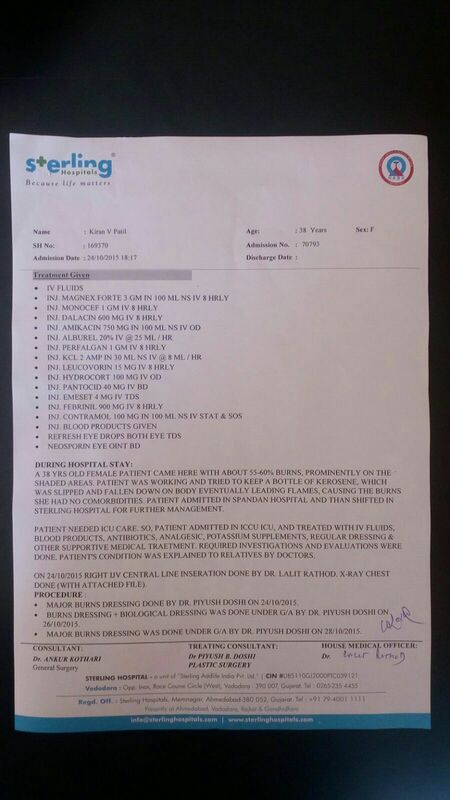 Deepali's mother, Mrs. Kiran Patil within no time was taken to Spandan hospital and immediate care was given. She was later shifted to Sterling hospital. There, upon further investigations and examination, Deepali and her father were informed that Mrs. Patil needed 3 moths of hospitalization and was required to undergo certain surgeries. The amount summed up to 13 lakhs. Deepali's family was successful in gathering half the amount. 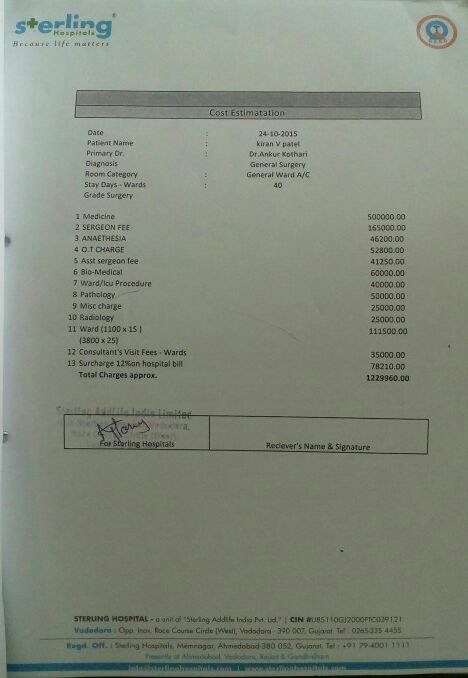 Also, Mrs. Patil was secured with 3 lakhs of insurance. The real struggle was to gather the remaining amount. And that's when we decided to step in. We paid a visit at Sterling. We also had a talk with Mrs. Patil's doctors. These interactions helped us realize the gravity of the situation. Hence, came the idea of crowd funding. Meanwhile, Diwali had arrived. Everyone was busy preparing for the festivities which were about to start in less than a week. Getting funds from people manually was almost an impossible task. Also, we knew that people would be busy with work and preparations, that it would be difficult for them to pay a visit at the hospital and submit their donations or go to a bank for the same. So, we decided to collect donations online. A section for donation was created on www.connectfoundation.co/donation where in very easily one could donate the amount in no time. A word was sent out on social media. We tried to get in touch with as many people as we could who could help us collect a handsome amount. Luckily, the idea of online donation fared well and we received a heart warming response. Donations from the US were also received. Within a span of four days, we were able to collect approximately 2 lakhs. And the donations are still flowing in. This helped us realize the power of social media if used in the correct way. We're thoroughly overwhelmed by the response we've received from Barodians. This was a result of trust invested in us by Deepali and her family, our belief and your unending support. A thank you would be too small a word for what was impossible without you. Please feel free to get in touch with Deepali Patil :- +918866488638 (Daughter of the patient Mrs. Kiran Patil) or me Chetan Suslade (+919724219208). Please help ASAP and as much you can. We are transferring the surplus funds towards Darshan's campaign. We thank you for your love and support. 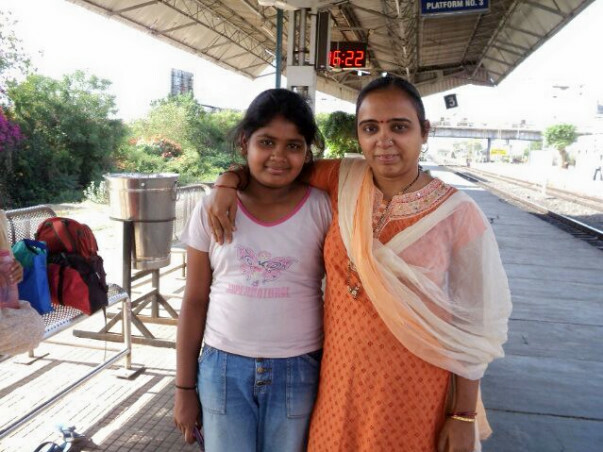 Kiran Patil underwent multiple surgeries to treat her burns. She also had successful plastic surgeries to repair her skin. Although she understandably has visible scars on her body, none of her organs suffered any lasting damage. Initially, Kiran went through a lot of struggle adjusting to her appearance. However, with support from her family, she has regained her confidence. Deepali is now studying for her Chartered Accountant exams. She also conducts tuition classes for school children during her free time. Kiran is happy to spend time with her daughter. Both Kiran and Deepali have expressed their gratitude to Milaap’s donor for contributing to the campaign.